Story: Due to his excellent performance as a soldier, major Rand Banion was selected as the carrier of the X-O armor, which was in the possession of the US army. The terrorist group R.A.G.E. was attacking military installations in the US and needed to be stopped immediately. Banion bonded with the X-O armor just before being attacked by R.A.G.E. Selecting Rand Banion for the X-O armor had one flaw. The armor acted on the wearer's impulses. Banion being fearless meant that the X-O armor didn't fully activate its defences during the attack and Banion was killed shortly after the attack . After his death, a part of Banion's personality resurfaced in the armor. The armor had made a personality file from Banion when he used it. It was the armor's way of helping Donovan Wylie, the next to wear the armor . Skills & abilities: Rand Banion was merged with the X-O armor, which gave him flight, wrist blasters, super strength and invulnerability. 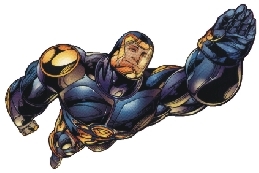 Background notes: Rand Banion was the first X-O Manowar in the reboot of Valiant Heroes (VH-2). The series was the flagship of the new universe as the first X-O Manowar series was the best selling title at Valiant/Acclaim and the last to fold. The X-O armor should have been the link to the original Valiant Universe (VH-1) as VH-2 was created when Aric and the X-O armor was send back to 410 A.D. The series worked fine as a story about a guy in an armor like Iron Man (Marvel Universe) or Prototype (Ultraverse), but as a link to VH-1 it was a mistake. Continuity wise the idea had too many holes and discrepancies. Concept wise it had nothing to do with the original series apart from the appearance of an armor of alien origin.